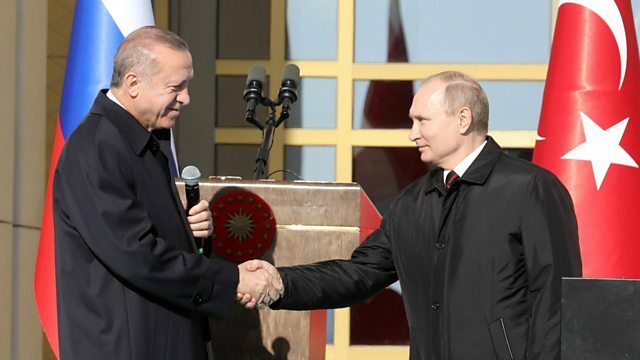 The Russian and Turkish presidents, Vladimir Putin and Recep Tayyip Erdogan, have promised closer cooperation between their countries at a meeting in the Turkish capital Ankara. The Russian and Turkish presidents, Vladimir Putin and Recep Tayyip Erdogan - both increasingly isolated from the West - have promised closer cooperation between their countries at a meeting in the Turkish capital Ankara. Also in the programme: President Trump says he wants to send the US military to secure the southern border with Mexico; Spotify begins trading shares on the New York stock exchange; and the $30m Chinese manuscript that opens a window onto the Ming dynasty. Photo: presidents Erdogan (L) and Putin meet in Ankara. Credit: Getty Images.